This is a delicious, unctuous dish, perfect to ward off the cold!! Place everything in your slow cooker, set on high and leave to cook for 6 hours. Alternatively you can bring everything to a simmer on the stove and slow cook in the oven at 150 degrees for 4 to 5 hours or leave in a Wonderbag for 10 hours. Once your pork has surrendered and is falling off the bone, remove to a container, reserve the resulting cooking liquid and discard the veg and apple. 2 T tallow or cooking fat of your choice. 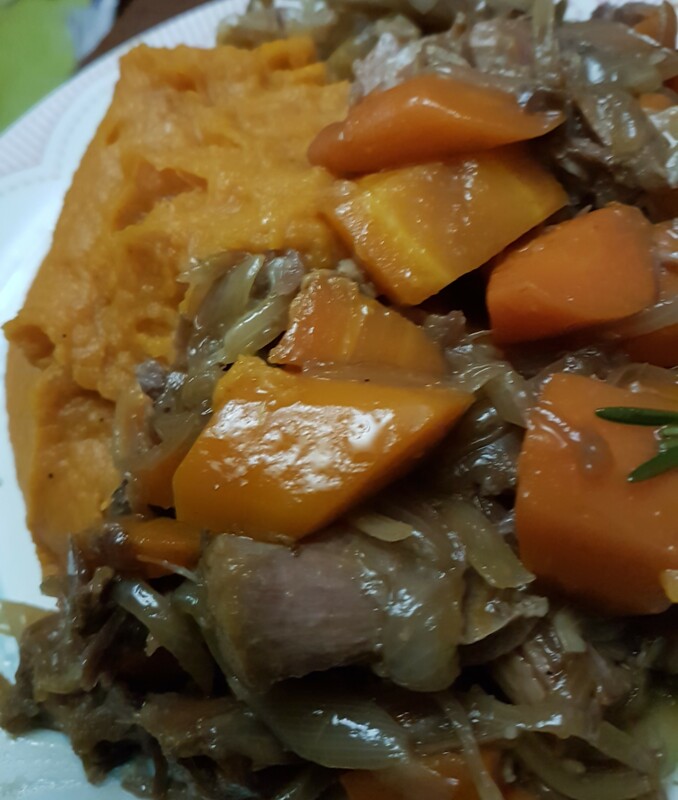 Melt the tallow in a heavy based pan and saute the onions, carrots and garlic with the rosemary until the onion is soft and translucent, add the cooking liquid from the pork and allow to simmer and reduce by half, add the pork meat, warm through and you’re ready to serve with sweet potato mash. I steam my sweet potato and whip up with some salt, coconut oil and cinnamon to serve, I’ve found a hand beater to be the very best potato “masher” ever.